British Columbia’s best kept secret is its wine. The first grape vines were planted in British Columbia in 1859. Today, the province boasts more than 340 wineries, growing upwards of 75 varietals, across more than 9,000 acres. So why haven’t you heard of BC wine? Because British Columbia only produces about 2 million cases of wine each year, and most of it is consumed by British Columbians. To taste the full variety of BC wine, and to see the stunning wine regions, you need to travel here yourself. From Vancouver, the two most accessible wine regions are the Okanagan Valley (five hours by car, or a one-hour flight), and the Fraser Valley (about 1 hour by car). The Okanagan is the province’s premier wine growing region and is sometimes called “Napa of the North”. It boasts more than 172 licensed wineries and a desert-like climate in the summer that is ideal for winegrowing. Here the sky is blue, the pace is relaxed, and vineyards stretch down the hillsides towards pristine lakes. In the Okanagan, you’ll find the province’s most recognized wineries such as Mission Hill, Quails’ Gate and Summerhill. The region also boasts a variety of accommodation – from luxury hotels to cozy B&Bs. No visit to the Okanagan is complete without an al fresco meal at one of the many winery restaurants, a swim in the lake, and a day-or-two spent wine touring. The Fraser Valley is on the outskirts of Vancouver and makes a lovely daytrip anytime of year. The Fraser Valley is an agricultural wonderland. Over half the province’s agricultural activity is centered here. In the Fraser Valley, the winery experience is not limited to tastings – several wineries also offer culinary experiences such as farm tours and bistro dining. Top stops in the Langley and Aldergrove area include Vista D’Oro, Township 7 and Chaberton Estate Winery. 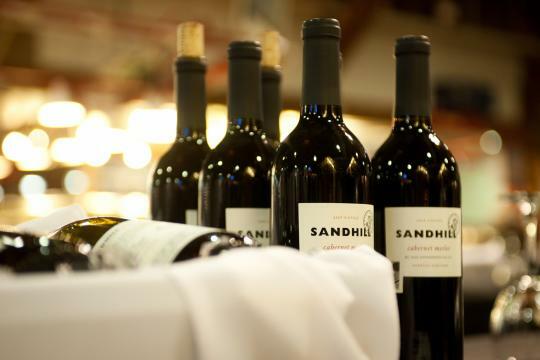 British Columbia’s thriving wine industry attracts winemakers from all across the globe. Each of these talented individuals have brought something fresh to our community and helped to shape a style that is uniquely British Columbia. From soil to sunshine to slope of vineyard, each bottle of BC wine delivers a diverse sensory experience that is as extraordinary as the province itself. Every sip is a charming reflection of the people and the land from which it is crafted. Last year, BC wineries won over 2,000 medals in national and international competitions. With each new accolade, our wine regions continue to solidify their place amongst the best in the world. Your trip to Vancouver isn’t complete without tasting at least a little of the local juice. Vancouver itself is a city that truly supports local products, making it extremely easy to enjoy the local wines. At your Dine Out Vancouver Festival dinner, be sure to ask your server to recommend a great glass of BC VQA wine to pair with your meal. Discover BC Wine Country with this interactive Trip Planner from Wines of BC. Or download the 2016 BC Winery Touring Guide.